Once there was a lion in a jungle. The lion lived with his three assistants; a crow, a jackal and a leopard. These animals always took benefit of their proximity to the king of jungle. Once day, they saw a camel in the jungle. They were surprised because camels usually live with humans. On enquiring with the camel, they found that the camel had lost its way. The lion gave asylum to the camel and assured him of all the safety. Thus the camel also started living with the lion and his assistants. Some time elapsed and one day, the lion got wounded in a battle with an elephant. He became too weak to even kill a prey. His assistants also had to suffer from shortage of food. 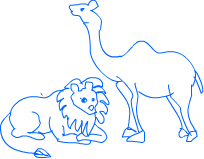 They suggested the lion to kill the camel for meal. But the lion was angry because he did not want to kill an animal which was under his security. The assistants said that they would convince the camel to offer himself as food for the lion and then the lion should not have any problem in killing the camel. The lion agreed to this. According to the plan; the crow, the jackal and the leopard offered themselves to the lion as meal, one by one. They said that it was their duty to ensure that the king of jungle does not die because of hunger. But the lion did not kill anyone. On seeing that the lion did not kill anyone; the camel did the same thing. When the camel offered himself as a meal for the lion, the lion immediately killed the camel. After that, the lion and his assistants enjoyed a sumptuous meal.